Submit a bibliography of sources. Please note that ALL submissions will be uploaded to the Women’s Leadership site on d2l and will be available for viewing. Be sure to follow the guidelines provided regarding the topic and specific details. 1. Save your presentation and essay on a flash drive and deliver it to the Special Services Office, Room 101, in the Student Services Building. You will receive a signed/dated confirmation letter, and your flash drive will be returned while you wait. 2. Submit it via email to Special Services at ssso@rose.edu. In the subject line, enter ‘Women Shaping a Healthy Future’. You will receive an emailed confirmation letter within 1 business day. Log onto D2L (www.rose.edu/dl or https://d2l.rose.edu/). Select “Self Registration” on the menu bar beneath the RSC logo. Select “Women’s Leadership” and self-enroll. Upload submission in the drop-box listed “2013 Scholarship Submissions”. or Sherri Mussatto (smussatto@rose.edu) if you need additional information. RSC administrators are seeking improvements to the college through the Campus Advancement Plan, or CAP for short. When students visit the LRC they will have noticed that the offices for the Testing Center, Students with Disabilities, and the Student Tutoring are crammed into a small section of the building. With $7 million of the proposed $22 million, the LRC will expand to accommodate not only new offices, but also new spaces for students to read in a quiet and comfortable environment. Of some concern is the roof of the Aquatic Center, which leaks when it rains. Some doors in the Aquatic Center are warped enough that they will not open or close. Along with these renovations and upgrades, the Student Union will receive a makeover for students to feel more at home. RSC is a commuter college and has no housing or places for students to simply hang out and relax between class periods, according to Britton. So, the plan is to revamp the Student Union and Aquatics Center with $2 million of the $22 million in funds. Of the $22 million, $5 million will be used to place new fiber optic lines throughout the campus, and upgrade the campus network. A new sign is to be added on S.E. 15th St., costing $220,000. $4 million in funds will cover basic maintenance of facilities throughout campus, with new ceiling tiles, lighting, flooring, and external doors placed in various buildings across campus. The rest of the funds will be similarly used to renovate restrooms and mechanical instruments in the Health and Environmental Science Building. The 2005 bond issue the college received will be paid off in 2015. The proposed 2013 bond issue will run from 2013 – 2028. More information about the 2013 CAP Bond election can be found on flyers through out campus. Voting on this bond issue will take place March 5th. For the status of the bond issue, check out our story covering the election here. Neil Simon’s “Barefoot in the Park” premiered in the H.B. Atkinson Theatre on Feb 14 and ran through Feb 17. The play opens with newlywed Corrie Bratter, played by Hailey Moore, desperately trying to apply the finishing touches to a drafty and overpriced New York apartment. She wants everything perfect before her husband, Paul Bratter, played by Jeramie Holman, arrives home from work. Paul and Corrie seem like complete opposites. Paul is a stuffed shirt lawyer, just starting to make a name for himself. He is practical and reserved in every way. Corrie, on the other hand, is a free spirit. She is an impractical optimist with enough charisma for the both of them. The action really starts when Mrs. Banks, Corrie’s eccentric mother, played by Rena Vann, drops by unexpectedly. Like most overbearing mothers, she is critical of her daughter’s choices, but unlike most mothers, she does it in a humorous way. The funniest scene in the play is when Corrie’s brilliant idea to set her mother up on a blind date with their kooky neighbor, Mr. Velasco, played by Matthew Herdman, backfires. While Corrie and Mr. Velasco run off to get coffee, Paul and Mrs. Banks slowly make their way up five flights of stairs. Jeramie Holman and Rena Vann are hilarious together as they re-enter the apartment, disheveled and drunk. Supporting roles by Dvonte Stuart, as the telephone repairman, and Jake Searock, as the delivery guy, are also worth mentioning. Both actors complemented the main characters well and elicited their fair share of laughs from the audience. “Barefoot in the Park” is Rena Vann’s first production at Rose State and was perhaps the highlight of the play. Her comedic timing is highly tuned and her facial expressions are laugh out loud hilarious. Keep an eye on this young lady, as she is sure to have many more successful roles in her future. “Barefoot in the Park” is the student theatre’s third of four productions for the 2012 – 2013 season. “Short and Sweet: A Ten Minute Play Festival” is the final play this spring and runs April 18 – 21 in the H.B. Atkinson Theatre. As New York Fashion Week wraps up in the Big Apple, the styles are just getting started as we take a look to the hottest fall fashion. The style and new trends came in all forms during Mercedes-Benz New York Fashion Week, which got under way despite weather conditions February 7-14, with models and designers fighting off rain, snow and sleet. The biggest color this fall will be red, which isn’t much surprise, because when you think of red, you think of warm fires and fall leaves. It’s not being paired with your typical browns and greys this fall, but with jewel colors like bright blues, pinks, rich greens and oranges. One piece that is a have to have in your closest is the box shaped sweaters and was paired with a skirt on the runway, but you can pair it with a pant as well to still look trendy. Fall previews wrap up on Valentine’s Day, with the rescheduled Marc Jacobs show, going heavy on black and other dark colors, one of the many looks seen on the runway over the past week. 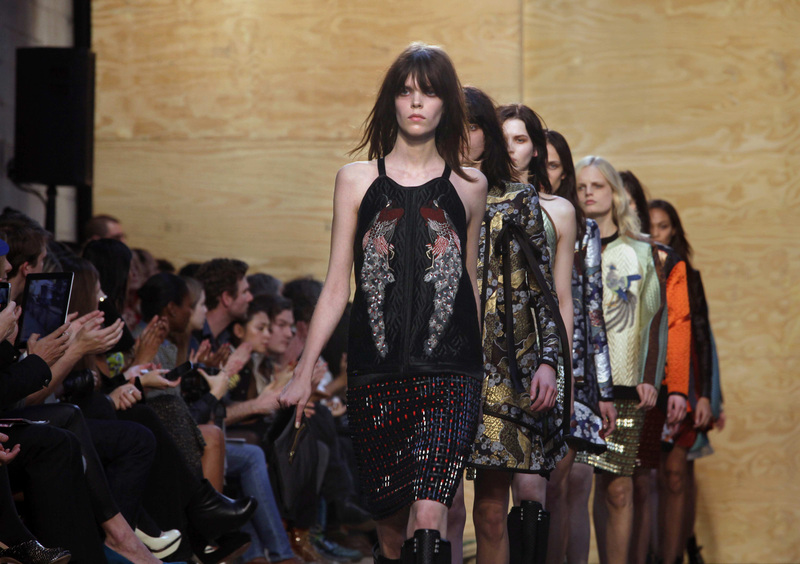 Tory Burch’s runway offered metallic fabrics and textured pieces. Motorcycle jackets were big for designer Phillip Lim, as were oversized coats. Models at the Alexander Wang show donned fur gloves and hoods, and Prabal Gurung featured military-themed accents. Rebecca Tayler, meanwhile, focused on more structured and tailored designs. As you can see the trends this fall will be a force to be reckon with as army cameo is becoming more and more popular. Indian Tacos! $6, Feb. 28 in the SS kitchen! Student Success and Financial Aid teamed up at RSC on February 13to relay scholarship information to students for the 2013 school year. 25 students gathered around the speaker in the Tinker Terrace Room receiving flyers, a detailed power point presentation and a chance to win an iPad. The workshop gave information about different scholarship opportunities here on campus, scholarship search websites, along with Ticket to Rose info and tips for writing a scholarship essay. The Ticket to Rose numbers are up for the month of February and are continuing to increase. Ticket to Rose in 2012 opened up to home school kids, private schools and alternative school kids, which increased the numbers as well. Members of three organizations (Professional Administrative Staff Association, Classified Staff Association and Faculty Senate) joined together Feb. 14 for a Valentine’s celebration in the Raider Room for the event, Just Desserts. Many claimed the reason they went was for the camaraderie from colleagues. Crystal Myers, I.T. services support assistant and CSA president, said Just Desserts gave incentive to the attendees who mingled. “What better way to draw in people than with food?” Myers asked, rhetorically. “Is there any other reason?” Pam Emmons, director of EmPower and EmPower Works, asked rhetorically, as well. Still, others in attendance found a far, more sinister reason: retribution. Seven campus “celebrities” volunteered for a pie to be thrown in each of their faces. Those who won the raffle—tickets sold at a dollar a piece—then picked from these seven of these “celebrities,” including Isabelle Billen, Bret Wood, Ken Roper, Chris Leland, Chris Meyer, Tim Campbell and Brian Perryman. Proceeds benefitted all three organizations. Although the “celebrities” tried keeping unblemished by wearing safety glasses and see-through, plastic ponchos, none escaped the ramifications of the raffle. In fact, student Shelby Simons attended Just Desserts to witness whipped cream smeared across the face of Perryman, the director of the Professional Training Education Center. 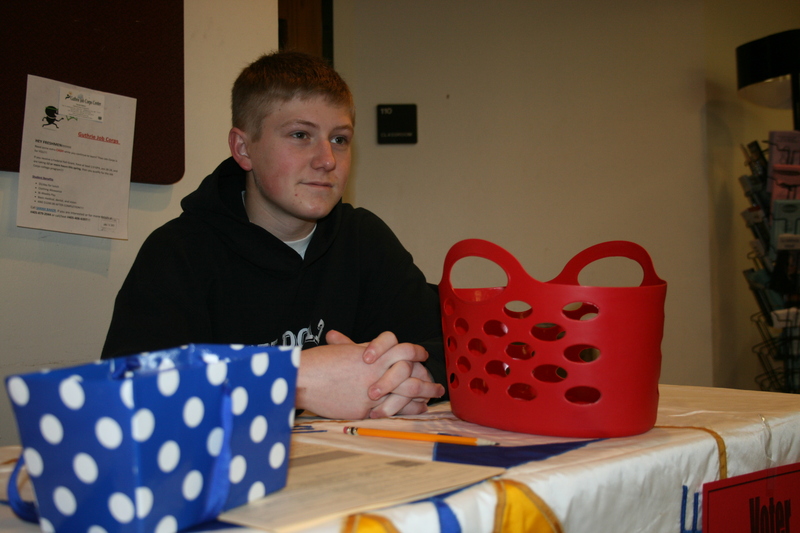 Simons works as an office aide with Perryman. Perryman, who will serve as the next PASA president, considered the pie thrown into his face as a rite of initiation, even exclaiming glee. “I think it’s important to celebrate camaraderie, love, peace and goodwill,” outgoing PASA president said, Bob Davis. Despite the mess in the Raider Room, the whipped cream didn’t hit the fan. The third Bart & Nadia Sports & Health Festival will be held Feb. 16 from 9 a.m. – 5 p.m. at the Cox Convention Center in Oklahoma City. Attendance is free. A variety of events will take place including several health and fitness related booths offering information on exercise, sports, health care and nutrition. Various health screening booths will offer smoking cessation information, dental screenings and general physical fitness assessments. Many of the weekend’s activities are geared towards children. The Perfect 10 Fitness Challenge will award kids a gold medal upon completion of ten fun fitness activities, such as kayaking, archery, basketball, and volleyball. Kids can also participate in the Bart Conner Gymnastics Academy activities, play hockey games with the OKC Barons, shoot baskets with the OKC Thunder Girls and run the bicycle safety obstacle course. All children that complete the obstacle course will receive a free helmet. Attendees who stop by the OU Athletics Trailer can sign up to win an iPad or play Xbox Kinect games on the 60” TV. Kids will have the chance to get their picture taken with Boomer and Sooner from the University of Oklahoma while learning about fitness fun, academics and sportsmanship. Adults will have plenty to keep them busy as well. OKC Riversport is sponsoring the RUNderground, a 5k run in OKC’s underground. Other activities include the USTA tennis challenge, UCO’s powerlifting competition, and four gymnastics meets. “We are not only excited to be hosting a weekend full of gymnastics, but we are thrilled to be providing Oklahomans with a day of free health information and fun fitness activities to promote and encourage healthier lifestyles,” Olympic Gold Medalist and legend Nadia Comaneci said. Since 2011, The Bart & Nadia Sports & Health Festival, in association with The Oklahoman, has encouraged families to take ownership of their health through activities that embrace Olympic and Paralympic ideals with an emphasis on sports, nutrition and wellness. February is Black History Month and Student Activities is hosting a contest to test student’s knowledge of the history of this celebration. Each week on D2L will feature a quiz for students to take. There will be a new quiz each week, with random questions generated from a bank of over 100 questions. The quiz will be open from Sunday to Saturday. Multiple attempts will be allowed, but the questions change each time. Participants will be entered into a drawing for one of two $50 Wal-Mart gift cards each week, to be held the following Tuesday. The final drawing for the last two gift cards and a grand prize of an iPad will be held March 5. In order to be entered into the iPad drawing, participation in each week’s quiz is required. Historian Currie Ballard examines a grave at Beulahland Cemetery near Langston, Oklahoma. Several towns in Oklahoma that were among the settlements built by African-Americans are hoping looking to draw tourists based on their history. A little lesser-known history about Oklahoma is that it was originally intended to be an “All-Black State,” as introduced by a bill in the 1880s from Sen. Henry Blair(N.H). Oklahoma was promoted for people starting anew after the abolition of slavery, and resulted in over 40 all-black townships. The Social Sciences building will feature a display in the large display case on the east end of the building that features more facts about Oklahoma’s African-American roots. I ate the chocolates without completing my exercises. I think this is my wrap for Fab Ab February. Why isn’t school cancelled today?! I realize the streets are fine, but I was really looking forward to staying in bed all day. Plus, I had a flat tire this morning! Ugh, this day is not working out the way I had hoped. Well, despite all that I still managed to get my workout done. I didn’t go to Pilates this morning (reference flat tire comment), so I did a few extra sit-ups, which brought my total to fifty-five sit-ups, ten push-ups and ten 35-second planks. Tomorrow is Valentine’s Day and I have promised myself I will complete my challenge requirements for the day. That way I can eat my box of chocolates without any guilt! If tomorrow is a snow day, then I’m taking the day off from Fab Ab as well! Please let the streets freeze overnight! Despite the horrible weather today, I managed to complete my forty sit-ups, ten push-ups that nearly destroyed my will to live and seven 35-second planks. The planks are so easy compared to the push-ups. I wish I could add planks in lieu of push-ups. Ugh, how is it Monday again? Seriously nobody likes you, Monday. Just leave and never come back. Ever. I did manage to complete my exercises for today though. I did thirty-five sit-ups, nine push-ups and five 35-second planks. I had to scale back on the planks today. My back muscles are very tight and sore, so I wasn’t able to do the last two planks. Rest days are the best days! I’m so happy I don’t have to do anything today. I feel awesome doing this challenge, but I realize the importance of rest more than ever. Rest days are essential for staying on track. If we reach burnout and don’t allow for proper downtime, then we are setting ourselves up for failure. Now please excuse me while I go take a nap for an hour or three. So glad tomorrow is a rest day! Today I completed thirty-five sit-ups, nine push-ups and seven 30-second planks. This challenge is definitely getting harder. The planks are my favorite. They challenge me, but I don’t dread doing them like the other exercise whose name we will not mention due to the fact they are as evil as J.K. Rowling’s infamous antagonist. I wish I could tell you that the push-ups are getting easier, but they’re not. Today only added one push-up for a total of eight, but I barely got them done. I never realized that push-ups require you to use just about every muscle in your body, unless you do the girly push-ups, which I’m not. Totals for today are thirty sit-ups, eight push-ups and seven 25-second planks. One week down, three weeks to go! I am so glad that I accepted this challenge. Unlike most Wellness Center activities, this one does not have a prize. However, I think I will be rewarded at the end of the month when my abs and arms are toned. Today I increased my planks from five to seven, so my workout totals for the day are thirty sit-ups, seven evil push-ups and ten 25-second planks. Twenty-five sit-ups, seven (agonizing!) push-ups and five 20-second planks completed. My muscles are still pretty sore today, but overall I feel great. I noticed that my posture has improved over the last six days. I have a horrible habit of slouching, but I feel confident these exercises are helping me be more conscious when it comes to sitting up straight. Sore does not begin to describe my abs, back and arms. I’m blaming the push-ups! I also think all males doing this challenge need to double their push-up requirement. Seriously, your Y chromosome has an unfair advantage when it comes to upper body strength. I am not motivated to do this challenge today. Yesterday (Sunday) was a great day because it was a “rest day.” However, Monday mornings are not my friend and I’m procrastinating on the challenge. Okay, feeling better! I completed my twenty sit-ups, six push-ups and five 20-second planks. I’m glad I did it and didn’t blow off the challenge, but I still loathe push-ups! It’s Saturday, which is normally a rest day for me. I managed to do my fifteen sit-ups, five push-ups and five 10-second planks, but I’m not feeling as good as I did yesterday. My abs are a little sore, but my arms hurt the most. I have a feeling the push-ups will be the hardest part of this challenge. It’s the first day of the Fab Ab February Challenge and I completed ten sit-ups, four push-ups and five 10-second planks. Today was fairly easy. I barely broke a sweat and my abs didn’t even start to burn. This is probably thanks to my Pilates class on Mondays and Wednesdays. I am looking forward to the rest of the month’s challenge. I know it’s going to get harder, so I’m very thankful for this easy day.